Paskuhan: 'Paskong Tomasino'... | One for UST!!! A beautiful image of the Holy Family surrounded by golden rays of the sun was the spectacular décor of the UST chapel where a Christmas concert (the 9th) marked the university’s 400th anniversary. The UST, older by eight years than Harvard U., proudly drew the best performers from its hallowed halls — faculty members and alumni — for the occasion. The choral groups — the Coro Tomasino under Ronan Ferrer, Liturgikon Vocal Ensemble under Eugene de los Santos and the Conservatory of Music Chorus under Ma. Theresa Vizconde-Roldan — joined forces to produce thunderous sounds to the accompaniment of the UST Symphony Orchestra under conductor Herminigildo G. Ranera. The program consisted mostly of Christmas selections for voice or orchestra, the Ave Maria by G. Caccini was rendered by Korean soprano Sim-Sung Hye with ringing, long-sustained high notes. Varying degrees of vocal skill, competence and excellence marked the refined rendition by sopranos Nenen Espina, Thea Perez Prosia and Naomi Paz Sison. Exceptional animation and gusto characterized the interpretation of leading tenors Lemuel de la Cruz, Eugene de los Santos and Ronan Ferrer. Further, they sang difficult passages with security and brilliance. In her solo, soprano Harlene Grace L. Magsino showed fine nuances and sensitivity of style. Celebrated international pianist Raul M. Sunico played relatively simple improvisations for a pianist of his virtuosity; his phrasing, clear and rich tonalities made the melodic lines surface exquisitely. The object of considerable wonderment was alto sax player Archimedes Lacorte, his enormous technical skill and sustained control fully evident in Pasko Na Sinta Ko, and Payapang Daigdig. Andrew Fernando’s sumptuous singing, his unmatched power, sonority and resonance, his vocal sweep were utterly magnificent. The international baritone was completely, unqualifiedly the Drummer Boy. Twelve-year old boy soprano Patrick Packay, still a work in progress, took his turn singing Little Drummer Boy with aplomb. Twice named “Choir of the World”, twice winner of the Pavarotti Trophy in Wales, UK and of countless other international prizes, the UST Singers under world-renowned pianist-composer-conductor Fidel Gener Calalang, Jr. awed and overwhelmed listeners with O Nata Lux by Nicholas White, Kampana ng Simbahan arr. by Calalang, and Heto Na Naman by R. Cayabyab sung a cappella. The legatos, the meticulous style, the sentiment and sensibility were arresting and compelling. Singing without scores to totally focus on each song, the choristers under Calalang never missed a detail to make their interpretation more dramatic. The forceful voice of soloist Noel Azcona rose and rang in the last number. The choir received lusty applause for its blazing, volcanic performance. A most sought-after soprano, the celebrated Rachelle Gerodias who has won several international awards, and starred in various operas in Europe and Asia, showed superb control of dynamics, delicacy of feeling, sensibility, keen intelligence and an exhilarating, vivid vocal art. The finale of voices from the three choirs, the UST Singers and individual soloists was a synthesis of the glorious, overwhelming concert which inspired — and fired the imagination, setting the ultimate standard for the next 100 years! Messages were given by Fr. Quirico T. Pedregosa, Prior Provincial and Vice-Chancellor; Mayor Alfredo Lim, Fr. Rolando V. de la Rosa, Rector; and Fr. Isidro C. Abaño, Quadricentennial Executive Director. Following a tradition that echoes the European practice of holding grand concerts in magnificent churches and cathedrals, the UST Christmas Concert Gala was held last December 1 at the Santisimo Rosario church (UST Chapel) with music and songs by the University’s renowned choral performers, namely the UST Singers, Coro Tomasino and Liturgikon Vocal Ensemble,. This year’s concert featured a medley of Filipino Christmas songs such as G. Caccini’s Ave Maria, P. A. Yon’s Gesu Bambino, G. Rossini’s Air et Choer ‘Inflammatus’; and Salamat Maria. Featured vocalists were Rachel Gerodias, Sim Sung Hye, Nenen Espina, Thea Perez, Naomi Sison, Lemuel de la Cruz, Eugene de los Santos, Ronan Ferrer and Andrew Fernando. Providing accompaniment par excellence was the UST Symphony Orchestra (USTSO) under the baton of Prof. Herminigildo Ranera. Dec. 1, 12:14 a.m. - THIS year’s edition of the annual UST Christmas Concert Gala is not the last, the Rector and event chairpersons said earlier this evening. Rumors say that its ninth installment, the Quadricentennial edition, would be the last showcase of the annual concert as its four-year co-chairperson, Maricris Zobel, will be experiencing conflicts in her schedule and will no longer be able to organize the event. But Fr. Rolando de la Rosa, O.P., Rector of UST, said tonight’s presentation—which he himself said to be the best since its first presentation in 2003—had changed Zobel’s mind. “I think I’m in this for life,” Zobel said after the two-hour musical exhibition. She added that she would continue to support the event because of tonight’s outcome, which featured home-grown talents such as Conservatory of Music Dean Raul Sunico, premier sopranos Rachelle Gerodias and Sim Sung-Hye, the UST Symphony Orchestra, Liturgikon, Coro Tomasino, Conservatory of Music Chorus, tenors Lemuel de la Cruz, Eugene delos Santos, and Ronan Ferrer, baritone Andrew Fernando, the two-time Choir of the World UST Singers, and its conductor Fidel Gener Calalang Jr. According to Zobel, the highly-commendable diversity of Thomasian performers and the overall look and feel of the event moved her and compelled her to continue participating in the event as the concert’s co-chairperson. The Christmas season is always a season for special events — fundraising auctions, fashion shows, benefit runs and tiangges, among other activities. A special event like a gala concert is a “marketing tool” and an integral part of an your annual campaign. It usually has twin objectives: to gain or sustain awareness by introducing or re-introducing your organization to new people and existing supporters, respectively, and to raise funds to support an advocacy or a cause. It is also a platform where your organization can showcase exactly who you are, what you do and say “thank you” all at the same time. Every event starts out as a first-time one. You can make it work well if you take time, muster patience, do it with flair and creativity and get lots of organized help. Your event becomes even more meaningful if you are able to leave every invitee with added information about you and a load of inspiration as to why you and your project matter and thus, should be supported. Your guests come with expectations, and your responsibility is to meet such expectations. Don’t disappoint them! 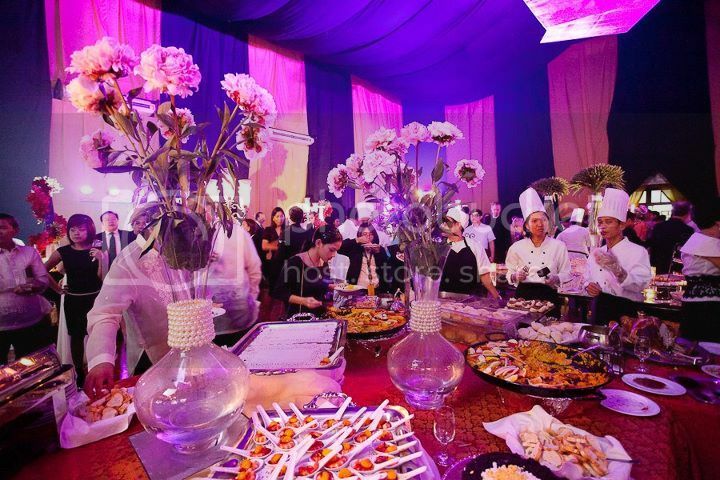 The whole idea of a special event is not necessarily to have a party. But it’s well and good if there is one. The more important thing to critically monitor is donor acquisition and donor retention. First-time attendees must get the experience they deserve, as you retain the loyalty and patronage of existing supporters. You must not lose sight of the fact that special events are meant to make people enjoy being at your event as they get educated or informed. After your successful event, ensure that you do the post-event activities like promptly sending individual thank-you notes to your donors, guests, celebrities, sponsors, media invitees, and whomever else you need to thank. Maybe after a week or two, get everyone back together to collectively assess the event — determine what could be improved and praise all the parts that went extremely well. Congratulate everyone and immediately solicit support for the next one. The newly installed carillon bells shrouding the façade of the UST Chapel struck the opening note in the quadri-centennial edition of the UST Christmas Concert Gala, which was held recently at the UST Chapel. It was a sound that the guests listened for, and it did not disappoint, as Raul Sunico, Dean of the UST College of Music, carefully pressed the start button. Originally intended to be a timely event staged to bring joy and express gratitude to the university’s friends and benefactors towards the year’s end, Rev. Fr. Rolando V. de la Rosa, OP, UST Rector joins UST Christmas Concert Gala chairpersons Fr. Isidro C. Abaño, OP, executive director for Quadricentennial Activities and Highlights, and Maricris C. Zobel, art patroness. It is held under the auspices of sponsors that have loyally supported the concert gala through the years. Today, the UST Christmas Concert Gala, sponsored this year by the Belo Medical Group and San Miguel Corporation, has become an institutional event in the Thomasian community that resonates with the European tradition of mounting majestic concerts in magnificent churches and cathedrals. Consistent with its name, the annual event has been graced by invited guests who have turned patrons of the university’s Heritage Conservation efforts and the Conservatory of Music’s Scholarship Fund. There were numerous elements in the 2011 gala that brought oohs and “aahs” and loud applause from the audience, starting with Prof. Hermie Ranera’s arrangement of A Christmas Festive Overture, played by the UST Symphony Orchestra, seamlessly followed by the ringing of the carillon bell and Coro Tomasino and Liturgikon Vocal Ensemble’s rendition of Joy to the World and Angels, We Have Heard on High. The concert offered an array of musical talents whose stars, without a doubt, will shine brighter. Soloist Harlene Magsino, with Coro Tomasino and the Liturgikon Vocal Ensemble, performed Rossini’s Air et Choer Inflammatus (from “Stabat Mater”). Korean soprano Sim Sung-Hye sang Caccini’s Ave Maria. Three powerful divas: Nenen Espina, Thea Perez-Prosia and Naomi Paz-Sison, rendered Fr. Manuel Maramba’s arrangement of Gesu Bambino. Rachelle Gerodias displayed her renowned vocal talents, gleefully carrying out a Rejoice medley, while Archimedes Lacorte did a passionate sax interpretation of a Munji-arranged Pasko Na, Sinta Ko and Payapang Daigdig. The tandem vocal routine of baritone Andrew Fernando and boy soprano Patrick Packay delivering O. de la Cruz’s arrangement of Little Drummer Boy was a faultless blend that brought out the distinctive eminence of their individual voices. Tenors Lemuel de la Cruz, Eugene de los Santos, and Ronan Ferrer also added prominence and glitter with their powerful voices. The UST Singers brought the house down with their rendition of Nicholas White’s O Nata Lux and two other songs arranged by Ryan Cayabyab and Fidel Calalang, including the highly engaging Down by the Riverside. This ensemble definitely possesses vocal variety and their coming together brings total interactivity between them and their audience — precisely the reason why I believe they are the world’s best. Joining the illustrious performers towards the end of the concert, the audience would sing The First Noel, Hark the Herald Angels Sing, and Ang Pasko ay Sumapit. I was truly glad to have watched the ninth edition of the UST Christmas Gala and was amazed by the gigantic concert venue backdrop — a nativity scene with four angels on the side designed by Gino Gonzales, the colors of Christmas splashed in the performers’ outfits and the play of lights. Adding sparkle to the event was the illumination of the entire UST campus, which unmistakably spells Christmas. A sumptuous cocktail at the UST seminary gym followed right after the concert. Who’s who in metro society, the arts-and-culture scene and the diplomatic community were in attendance. 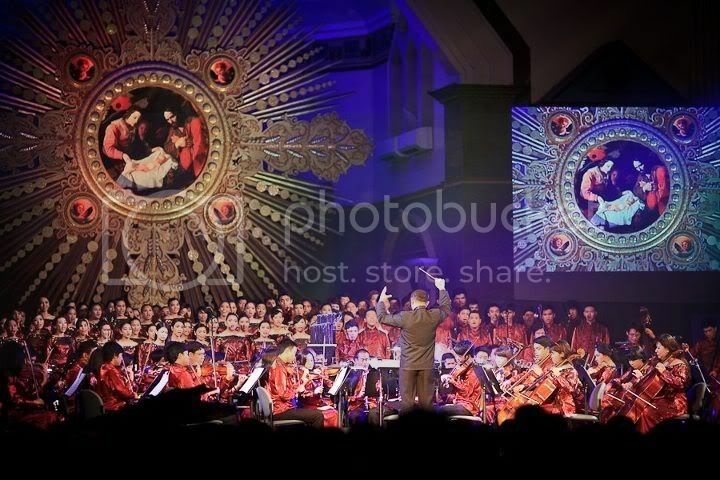 MANILA, Philippines — Christmas carols once again filled the august halls of the Santisimo Rosario Parish Church at the University of Santo Tomas (UST) in Manila with the holding of the 9th UST Christmas Concert Gala last December 1. Also commemorating UST’s 400th year anniversary, the Christmas Concert Gala was mounted to benefit the Heritage Conservation of the university buildings, the University Museum, its priceless works of art, and for scholarships at the Conservatory of Music. In his speech, UST Rector Fr. Rolando De La Rosa, O.P., said that the Christmas Gala Concert has done more than generate funds but has brought people with varying orientations together for a worthwhile cause. “The Christmas Gala Concert is the fruit of the union between the University and people who have the passion for the arts and the passion for giving. The University becomes the center stage where cultural doyennes, the movers and shakers of the Philippine economy, philanthropists, politicians, art connoisseurs, impresarios, academics and students come together to witness a spectacular display of world-class University talents and lend their support to the school’s efforts at restoration,” De la Rosa said. The Christmas Gala Concert showcases the University not only as an institution with a glorious past but as hub for cultural activities, De la Rosa added. “It has shown in a distinctly lyrical way that there lies within the bosom of the University priceless treasures — testaments to her glorious past and beacons to tomorrow brimming with hope and confidence to God’s unending grace,” he added. Yet, De la Rosa emphasized that there is still a lot to be done for the restoration work of other paintings, the oldest of which dates back to the 18th century. An estimated R30 million are still be needed for the restoration of more than 100 paintings and artworks currently stored inside the UST Museum. For the 10th anniversary of the UST Christmas concert in December 2012, De la Rosa said they hope that more people will come in to draw support to the conservation and restoration works of the University’s Museum of Arts and Sciences. Ms. Ma. Cristina C. Zobel, co-chair for the Christmas Concert Gala 2011, reiterated her deepest appreciation to various donors and friends of UST for their support. She also congratulated UST and its officials for maintaining its steadfast mission to help build strong Christian communities through quality education. “Your help has been most instrumental in restoring invaluable works of art that are embedded in our country’s rich history and culture. Your donations have also helped us to continue to provide for scholarships in the Conservatory of Music — whose students, faculty and alumni perform for us tonight,” Zobel said. The UST Christmas Concert Gala has become a tradition in the Thomasian Community to echo the European practice of holding grand concerts in magnificent churches and cathedrals. The Gala‘s chairpersons are Fr. Isidro C. Abaño, O.P., executive director for quadricentennial activities and highlights, and Maricris C. Zobel, art patroness. Among the performers for this year’s concert were the UST Singers, Coro Tomasino, and Liturgikon Vocal Ensemble. Featured vocalists included Rachel Gerodias, Sim Sung Hye, Nenen Espina, Thea Perez, Naomi Sison, Lemuel de la Cruz, Eugene de los Santos, Ronan Ferrer and Andrew Fernando. Other featured talent include pianist Dr. Raul. M. Sunico, dean of the UST Conservatory of Music. 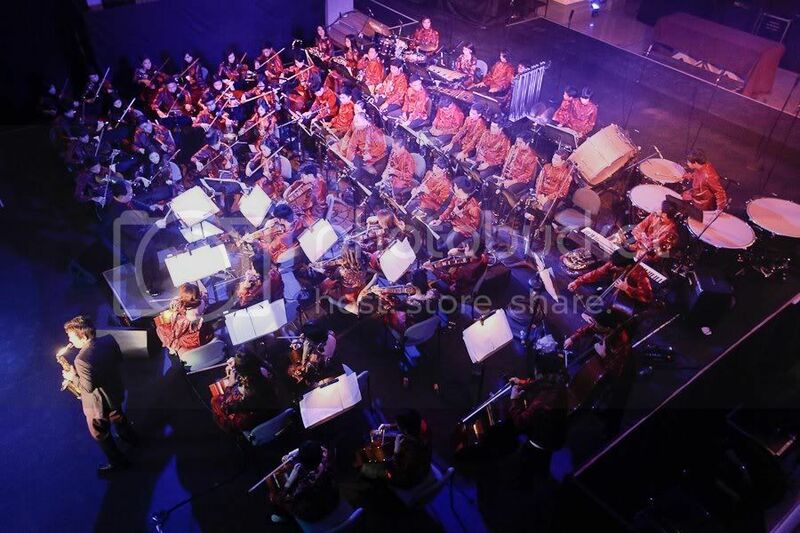 Providing accompaniment was the UST Symphony Orchestra (USTSO) under the baton of Prof. Herminigildo Ranera. One of the highlights of the Quadricentennial Christmas Gala Concert was the ringing of the newly installed Carillon bells in front of the UST Chapel. 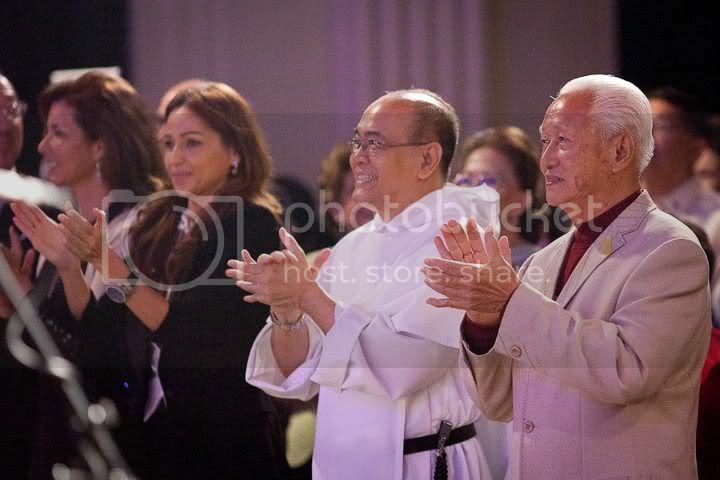 Among the personalities who graced the occasion were Manila Mayor Alfredo S. Lim, UST Vice Rector Rev. Fr. Pablo Tiong, the Zobel family headed by Don Jaime Zobel de Ayala, Dr. Vicki Belo, Ambassadors Roberto Mayorga of Chile, Agnes Nyamande-Pitso of South Africa and Nguyen Vu Tu of Vietnam, diplomats, UST officials, businessmen and many more. The Christmas Concert Gala of the University of Santo Tomas (UST) is one of the season’s most awaited events this part of town and will be held on December 6, 8 p.m. at the UST Chapel. Originally intended to be a timely event staged to simply bring joy and express gratitude to the University’s friends and benefactors towards the year’s end, the UST Christmas Concert Gala has since its inception become a tradition in the Thomasian Community that echoes the European practice of holding grand concerts in magnificent churches and cathedrals. As before, it will fill the august UST Chapel, also known as the Santisimo Rosario Parish Church—with music and songs by the University’s renowned choral performers, namely the UST Singers, Coro Tomasino and Liturgikon Vocal Ensemble. Top-billed for this year’s concert are Halina Jesus Christmas Medley, Marian Christmas Medley, G. Caccini’s Ave Maria, and C. Franck’s Panis Angelicus. Featured vocalists are Rachel Gerodias, Nenen Espina, Thea Perez, Naomi Sison, Clarissa Ocampo, Lemuel de la Cruz, Eugene de los Santos, Ronan Ferrer and Andrew Fernando. Providing accompaniment par excellence is the UST Symphony Orchestra (USTSO) under the baton of Prof. Herminigildo Ranera. And what would the concert gala be without some lilting audience participation? So if you will be in the audience, prepare to sing along Silent Night, Joy to the World and Ang Pasko ay Sumapit. Rev. Fr. Herminio V. Dagohoy, O.P., UST Rector joins chairpersons Fr. Isidro C. Abaño, O.P., UST Museum Director and Ms. Maricris C. Zobel, art patroness in presenting the UST Christmas Concert Gala. It is held under the auspices of sponsors that have loyally supported the concert gala through the years. Thus, the event welcomes donations which are earmarked for the Heritage Conservation efforts of the University and the Scholarship Fund of the Conservatory of Music. The Christmas Concert Gala of the University of Santo Tomas (UST) is one of the season’s most-awaited events even by those outside of the España campus who have experienced this rare Thomasian musical treat. On its tenth year, it will be held on December 6, 8:00pm at the UST Chapel. Originally intended to be a timely event staged to simply bring joy and express gratitude to the University community, friends and benefactors, the UST Christmas Concert Gala has, since its inception, become a tradition in the Thomasian community that echoes the European practice of holding grand concerts in magnificent churches and cathedrals. As before, it will fill the august UST Chapel, also known as Santisimo Rosario Parish Church – with music and songs by the University’s renowned choral performers, namely, the world-acclaimed UST Singers, Coro Tomasino, Liturgikon Vocal Ensemble, and the Hail Mary the Queen Children’s Choir. Top-billed for this year’s concert are: Brassy Christmas, Payapang Daigdig, Kampana ng Simbahan, Marian Christmas Medley, Christmas Fantasia, Suo Gan, Handel’s But who may abide the day of his coming from the Messiah, and Bach’s Jauchzet Gott in allen Landen, BWR 51. Featured vocalists are: sopranos Rachelle Gerodias, Thea Perez, Naomi Sison; mezzo-soprano Clarissa Ocampo, tenors Lemuel de la Cruz, Eugene delos Santos, Ronan Ferrer; baritone Andrew Fernando; and child soprano Victoria Bayle. Providing accompaniment are the UST String Orchestra, UST Brass Ensemble and the UST Symphony Orchestra under the baton of Prof. Herminigildo Ranera. The finale will consist of a medley of Filipino Christmas songs participated in by all performers while the audience participates in the singing of O Come O Ye Faithful and Joy to the World. Rev. Fr. Herminio V. Dagohoy, O.P., rector joins Concert Gala chairs Fr. Isidro C. Abaño, O.P., UST Museum director, and Ms. Maricris C. Zobel, art patroness, in presenting the UST Christmas Concert Gala which is preceded by the traditional lighting of the 66-feet UST Christmas Tree. The concert is held under the auspices of sponsors that have loyally supported the musical event through the years. Donations are welcome for the Heritage Conservation efforts of the University and the Scholarship Fund of the Conservatory of Music. Now on its 10th year, the Christmas Concert Gala of the University of Santo Tomas (UST) has become one of the early Yuletide season’s most-awaited events. It will be held, take note, dahlings, on Dec. 6, 8 p.m., at the UST Chapel, known as Santisimo Rosario Church. Tomorrow night, therefore, the beautiful UST campus will be echoing with music and songs by the university’s renowned musicians and singers, headed by the world-acclaimed UST Singers, and sopranos Rachelle Gerodias, Thea Perez, Naomi Sison; mezzo-soprano Clarissa Ocampo; tenors Lemuel de la Cruz, Eugene de los Santos, Ronan Ferrer; baritone Andrew Fernando; and child soprano Victoria Bayle. Providing accompaniment will be the UST String Orchestra, UST Brass Ensemble and the UST Symphony Orchestra, under the baton of professor Herminigildo Ranera, no less. Rev. Herminio V. Dagohoy, OP, Rector Magnificus of the Pontifical University, will join Concert Gala chairs—Fr. Isidro C. Abaño, OP, UST Museum director, and art patroness Maricris Cardenas Zobel—in welcoming the high-powered guests and benefactors of Asia’s oldest university. Joining them are Jonathan Matti and Andrew Gan, both executive committee directors of the organizing committee. The UST Christmas Concert Gala will be preceded by the traditional lighting of the 66-feet UST Christmas Tree. This one-of-a-kind concert has mega sponsors who have loyally supported this event through the years. Donations are welcome for the heritage-conservation efforts of UST and the scholarship fund of the UST Conservatory of Music. For more information, call associate professor Giovanna V. Fontanilla, director of the UST Office of Public Affairs, at 7313544 or 7861611 loc. 8315. 06 December 2012, 11:41 p.m. - NOW ON its first decade, the UST Christmas Concert Gala has become an annual tradition among Thomasians and a fitting reminder of how God became man and dwelt among the people, UST Rector Fr. Herminio Dagohoy, O.P. said earlier this evening in his welcome remarks. A Christmas tree-lighting ceremony with event chairwoman Maricris Zobel and Conservatory of Music dean Raul Sunico opened the concert. The annual gala became a perfect opportunity to showcase homegrown talents. Among the performers were Coro Tomasino, the UST Singers under conductor Fidel Calalang, Jr., and the UST String Orchestra and Brass Ensemble led by Prof. Herminigildo Ranera. Christmas hymns were performed by students, alumni, and faculty members. Among them were the triumvirate of sopranos Nenen Espina, Thea Perez, and Naomi Sison, and tenors Lemuel de la Cruz, Eugene delos Santos, and Ronan Ferrer. Renato Lucas and Lourdes Gregorio performed a duet titled “Siciliene” on cello and harp, respectively. Also gracing the concert were baritone Andrew Fernando, mezzo-soprano Clarissa Ocampo, and premiere soprano Rachelle Gerodias. 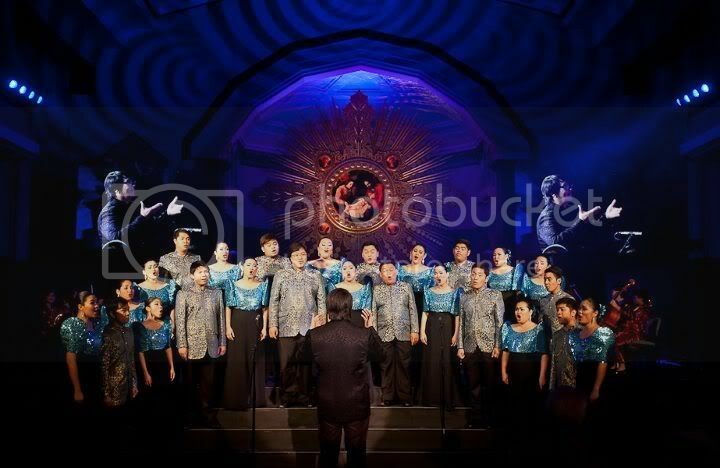 Aside from Thomasian musical prodigies, the concert also featured the Hail Mary the Queen Children’s Choir. 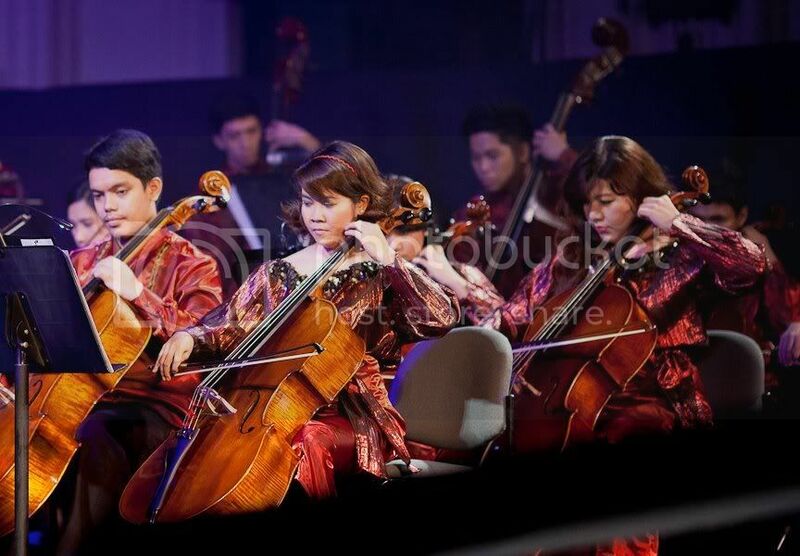 One of its members, Vyktoria Therezze Bayle, sung “Payapang Daigdig” with the UST orchestra. Ranera said this year’s concert was one of the best so far, if not the best. Zobel, for her part, said the production has improved greatly since she became a part of it five years ago. 22 December 2012, 10:38 a.m. - LAST NIGHT could have been the end of the world according to the Mayan calendar, but there was no stopping the “concert capital” of all universities from celebrating Christmas with a blast. The second day of the two-day Paskuhan festivities started with a Disney fairytale-themed parade participated in by the different faculties and colleges. A pre-show featuring the UST Yellow Jackets, Thomasian Idol, and the 3/4 and Flooza bands was held alongside the parade to kick start the program. An estimated 70,000 Thomasians and outsiders gathered for the main program at the UST Grandstand and Open Field to watch the Salinggawi Dance Troupe and performances by Spongecola, 2 Years Apart, Silent Sanctuary, Letter Day Story, Join the Club, December Avenue, Mayonnaise, Paraluman, Urbandub, and Radioactive Sago Project. Yael Yuzon, lead vocalist of Spongecola, said he was overwhelmed by the crowd’s enthusiasm. The concert was capped by a six-minute pyromusical featuring pop songs Somebody That I Used to Know, We Found Love in a Hopeless Place, Oppa Gangnam Style, Titanium, and Payphone. The words “Go USTe” lit up on top of the Grandstand. To ensure the event’s security, the Security Office implemented a “buddy system,” wherein outsiders were not allowed to enter the campus unless accompanied by Thomasians, said Benjamin Zoilo Mario Ravanera III, president of the Student Organizations Coordinating Council. UST CHRISTMAS CONCERT. 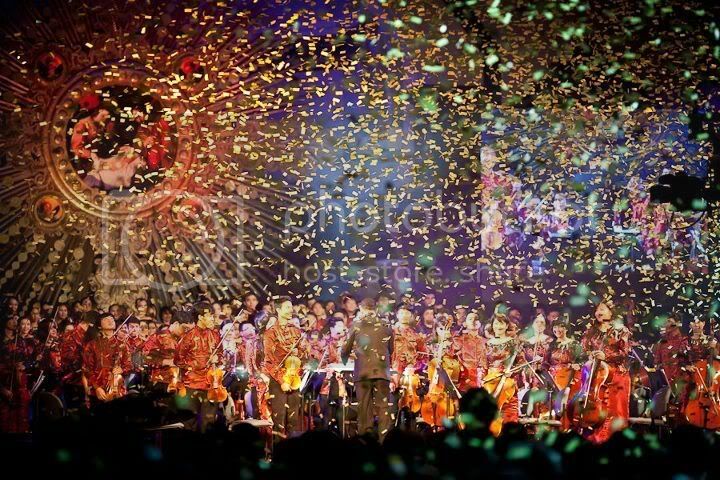 The UST Christmas Concert Gala 2012 will be aired on TV5 on 25 December at 1:45am-3:45am. With the theme “Pagdiriwang ng Pananampalataya,” the University of Santo Tomas (UST) commemorated its Paskuhan celebration on December 18 and 21 at the UST Grandstand. The event opened on December 18 with Panunuluyan, a traditional event portraying the search for the birthplace of the Messiah; which will be highlighted by a Eucharistic celebration with the Master of the Order of Preachers and Chancellor of the University of Santo Tomas, Very Rev. Bruno Cadoré, O.P., as main celebrant and UST Rector, Rev. Fr. Herminio V. Dagohoy, O.P as homilist. An agape will follow the concelebrated mass. On December 21, the festivity that came with the Paskuhan celebration began with a parade participated in by students, faculty members, employees and administrators from different faculties and colleges. Popular bands added to the festive atmosphere and will perform live for the whole university community. Raffle prizes were also given away to lucky Thomasians. A much-awaited event by every Thomasian, Paskuhan is the time for the Thomasian community to celebrate friendship and camaraderie. It is also the season for thanksgiving and devotion as it coincides with the Catholic Church’s commemoration of the “Year of Faith”. The Paskuhan culminated with the lighting of the night sky through a series of fireworks display which students look forward to every year. One of the most disconcerting things about Christmas concerts is that you get an overdose of Christmas carols some of which are better off heard on noontime TV shows than showcased in a formal concert. Sometimes the artists accept one engagement too many. On some nights, you hear them sounding like they have been staying late for days on end. But the latest edition of the UST Christmas Concert managed to elude holiday traps and musical clichés with a tasteful program enhanced by a dose of fresh singing from guest artists, most of whom are artists of consequence and homegrown talents from the University of Santo Tomas, which turned 401 years old this year, the oldest university in Asia. Grand, focused and refreshing was the opening number, “A Brassy Christmas,” rendered by the UST Brass Ensemble with Christmas numbers tastefully arranged by Herminigildo Ranera. Indeed, it was a fitting opening number for the succeeding solo number of child soprano Vyktoria Therezze Bayle, who sang Felipe Padilla de Leon’s “Payapang Daigdig” with the UST String Orchestra. Bayle’s nightingale voice beautifully floated above the orchestra, and hers was an enchanting voice seldom heard these days. A cerebral feast for the ear was the rendition of Jose Mari Chan’s “Bells at Christmas” and Juan Silos Jr.’s “Kampana sa Simbahan,” by the Hail Mary the Queen Children’s Choir directed by Maria Theresa Vizconde Roldan. If this number sounded like a gymnasium spectacular, it was because the soloists were pitted against each other with the ensemble singing like a vocal duel and confrontation. The applause was deafening. Speaking of ensemble singing, the best treat came from the much-heralded UST Singers which sang Ryan Cayabyab’s “Ave Maria” with such verve while maintaining its delicate, haunting, parts. Conducted by Fidel Calalang, the UST Singers remained in good shape, glittering in their black ensemble get-up matching the dazzling Gino Gonzales stage design of the gala concert. For this music-lover, the seasoned soloists were the pleasant highlights of the concert. Soprano Rachelle Gerodias’ rendition of Bach’s “Jauchzet Gott in Allen Landen,” BWR 51, once again highlighted her vocal agility, her solid coloratura qualities, which all found their mark in the difficult passages. The epitome of vocal eloquence was baritone Andrew Fernando’s rendition of “Suo Gan,” again arranged and orchestrated by De la Cruz. A few pounds less and looking hale and hearty, Fernando interpreted the traditional song with breathtaking lines, the phrases sounding as though the piece had been composed for him. He is one of the few singers who can make traditional songs come alive with rare vocal artistry. I believe this kind of singing is the hallmark of what authentic singing should be. But the piece that brought me to the very essence of Christmas was cellist Renato Lucas and harpist Lourdes de Leon Gregorio’s rendition of Faure’s “Siciliene.” Also written for flute and violin with orchestral accompaniment, “Sicilienne” —this time performed for cello and harp—was just perfect for this Christmas gala heavily weighed down with Christmas carols. The melancholy and pastoral scenes inherent in the piece found eloquent interpretation from Lucas and Gregorio. One thought this was the perfect Christmas gift one could wish for. The concert culminated in a fitting finale where the community sang along with the performers, which all the more communicated the spirit of the season. This UST Christmas tradition is 10 years old this year, and it is a good time as any for good musical recollections. Fr. Herminio V. Dagohoy, OP, rector magnificus of the Pontifical University, pointed out the yearly musical event was actually more than a musical extravaganza. 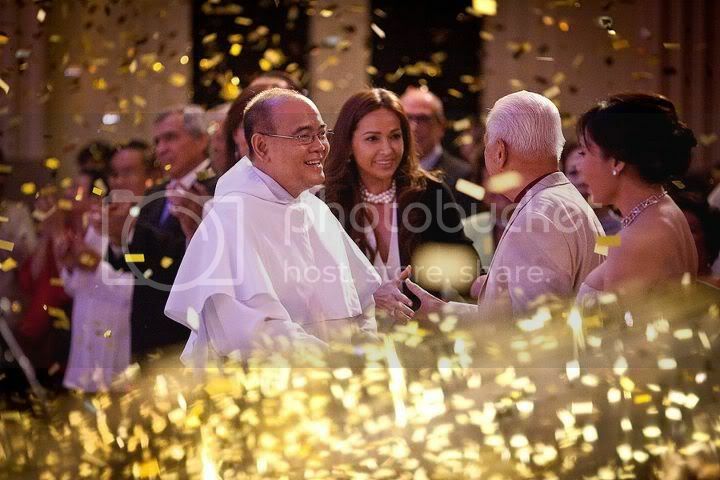 The concert was also a means of thanking UST alumni, friends and benefactors, who have supported the conservation and restoration cause, even as it showcased the immense musical talents of the school, noted Fr. Isidro C. Abaño, OP, director of the UST Museum of Arts and Sciences and co-chair of the concert gala. Maricris C. Zobel, Christmas gala co-chair, was profused with thanks for the supporters of the gala, among them Singapore Airlines, San Miguel Corporation and the Belo Medical Group. UST CHRISTMAS CONCERT. The UST Christmas Concert Gala 2012 will be aired on IBC 13 on January 1, 2013 at 12:00 nn- 1:00 pm. December 21 came and went despite doomsday predictions that were supposedly based on the Mayan Calendar. It may not have ended just yet. But the end of the (academic) year for the Thomasians truly did end with a bang at the annual UST Paskuhan that became a rousing success. One thing that draws Thomasians to the annual Paskuhan is the concert featuring a round-up of top bands. This year, Join the Club, Letter Day Story, Silent Sanctuary, Paraluman, December Avenue, Mayonnaise, Spongecola, Urbandub and Radioactive Sago Project kept the crowd moving, dancing, and showing some Thomasian holiday spirit. Spongecola’s spirited vocalist delivered one of the most mobile performances of the evening, going from one end of the UST field to the other. In one song number, he was even being carried by one of his assistants. Yuzon even braved the crowd as he climbed up the concert stage’s scaffoldings, from where the cameramen were shooting the stage and the crowd. Students were spreading some Christmas cheer as different groups from different colleges walked around the campus holding signs offering free hugs. Besides the students, even band members like Join the Club’s frontman Biboi Renia was sighted giving a hug as well. A fangirl near the concert stage waved a sign that said, “Biboi, pa hug,” while Renia was singing. The gallant frontman graciously relented, of course. 4. Gadgets, t-shirts, ticket to Hong Kong—for free! Another highlight of the UST Paskuhan is the raffle. Students, as well as UST faculty and staff won tablets, cell phones, and even an all-expense paid trip for two to Hong Kong. Others, on the other hand, also enjoyed the thrill of being able to catch t-shirts and CDs thrown at the crowd by bands like Mayonnaise. It is not just the usual eccentric people you see everyday on campus. Even mascots, mime artists, and a few students dressed up in costumes added more color to the celebration. Members of the Thomasian Nihon Kyokai, which is big in cosplay and Japanese culture, were all dressed up as various characters. The crowd just keeps getting bigger every year. Credit it to the growing number of UST community members, including alumni, who can’t get enough of their Paskuhan fix. At 4 p.m., you could see some students already marking their places near the stage. But the large audience, however, were all wowed as the performers commended that the crowd was game for anything. “Kahit ano sabihin mo magre-react sila, hindi patay yung crowd, di katulad ng ibang mga schools na tutugtugan namin na pa-sosy time,” shares Ramboyong. “Everyone wants to have a good time; yung scale lang ang laki e. Parang mas madami pang tao dito kesa sa crowd na pumupunta sa concerts ng foreign artists. It just goes to show you kung gaano kalakas yung energy ng UST,” commented Yuzon. Even though the high-profile performers were already taking centerstage at the grandstand, the UST chapel, the Santisimo Rosario Parish, at 8 p.m. was another venue inside the university that was jam packed as well. “The past Paskuhans were focused on the quadricentinneal, now that UST is commemorating its 401st year, we try to embody the theme of faith with our title Pagdiriwang ng Pananampalataya,” says Benjo Ravanera, President of the Student Organizations Coordinating Council. From brands such as Starbucks, Jollibee, Wendy’s and even student entrepreneurs selling dimsums, clothes and other gift items, the fair was another highlight of the UST Paskuhan. At 10a.m., students were already enjoying the eats and catching up on their Christmas shopping. “Ang ganda ng mga ilaw,” said Radioactive Sago Project frontman and TV5’s Lourd de Veyra. “Papasok pa lang festive na talaga.” But other than the Christmas lights decorating the University, there were another set of lights up in the air that made the whole Thomasian community stand up in awe. A 15-minute display of fireworks, set against pop music was one of the high points of the Paskuhan. Surely, a stiff neck is due, as your eyes would be fixed at the sky watching the fireworks display. Sobrang natuwa at natawa ako dito. Talagang kita sa Sampaloc district ang fireworks. i also like to get UP, La Salle, Ateneo and other commemorative folders. i am also interested in getting Banknotes and coins of the Philippines. MANILA, Philippines - The University of Santo Tomas (UST) Christmas Concert Gala, the most-awaited musical event on campus, will be held on Dec. 5, 6 p.m., at the UST Chapel. Now on its 11th year, the Christmas Concert Gala has contributed to charitable causes particularly the heritage conservation efforts of the university and the scholarship fund of the Conservatory of Music. This year, organizers decided to donate proceeds to the victims of typhoon Yolanda in the Visayas. Spearheading the benefit concert are the UST Rector, Fr. Herminio V. Dagohoy, O.P. and the UST Christmas Concert Gala chairpersons — Fr. Isidro C. Abaño, O.P., UST museum director, and art patroness Maricris C. Zobel. For this year, homegrown talents of the University will take center stage. Miracles (A Christmas Cantata) and a duet with her son, David Cruz of A. Adam’s O Holy Night. Two-time Choir of the World Champion, UST Singers under the baton of Prof. Fidel Calalang Jr., as well as the first Children’s Choir of the World Champion, Hail Mary the Queen Children’s Choir conducted by Theresa V. Roldan, will interpret popular choral pieces and Christmas classics. Completing the roster of performers are students and alumni from the Conservatory of Music to be joined by the UST Symphony Orchestra, Liturgikon Vocal Ensemble and Coro Tomasino. The traditional community singing will feature all-time favorites Silent Night, Hark the Herald Angels Sing and Joy to the World. Since its inception, the Christmas Concert has always been held at the UST Chapel, recreating the European tradition of holding grand concerts in magnificent churches and cathedrals. This is also UST’s way of giving thanks to its numerous friends and benefactors for the past years. Other featured performers are the world-renowned UST Singers and the UST Symphony Orchestra. For this year, beneficiaries of the strictly invitational gala concert will not be the heritage conservation program of the UST Museum of Arts and Sciences, the oldest museum in the country; or the scholarship program of the UST Conservatory of Music, the biggest music school in the region. Beneficiaries will be the victims of Yolanda, said Fr. Isidro Abaño, OP, co-chair of the concert organizing committee and director of the UST Museum. The letter of the UST rector to Abaño was in line with Manila Archbishop Luis Antonio Cardinal Tagle’s reminder to academic institutions and religious communities to review and evaluate their Christmas celebrations and to make necessary adjustments in the light of the earthquake and typhoon that affected the Visayas one after the other in October and November. Now on its 11th year, the UST Christmas concert will feature award-winning singer and theater actress Dulce, a Visayan herself. She will perform J. Peterson’s “Night of Miracles (A Christmas Cantata)” with the UST Symphony Orchestra and Herminigildo Ranera’s arrangement of A. Adam’s “O Holy Night.” She will perform the latter with her son, David Cruz, an alumnus of the UST Conservatory of Music. 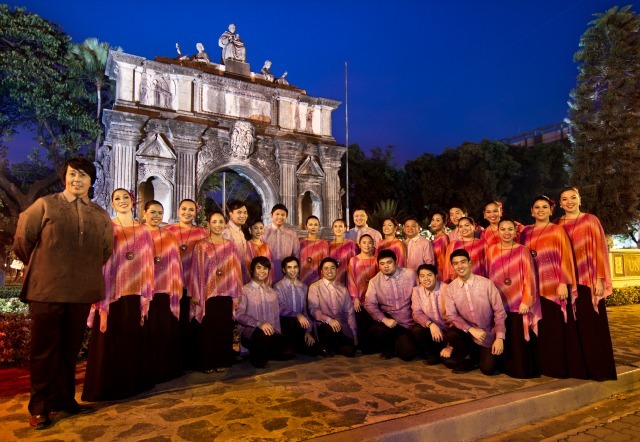 The UST Singers, the only choir to have won the Choir of the World title (Pavarotti Prize) of the Llangollen International Musical Eisteddfod in Wales, will perform G. Rossini’s “Barber of Seville Overture.” Conductor is professor Fidel Calalang Jr.
To open the concert is a performance of M. Leontovych’ “A Christmas Prayer: Carol of the Bells” and A.H. Malotte’s “Lord’s Prayer,” to be sung by Christian Nagaño, Micah David Galang, Ma. Pilar Charlene Ramos and Frances Alyanna Leoncito. UST Conservatory of Music faculty members—flutists Erick Barcelo and Gary Silangcruz; bassoonist Adolfo Mendoza; and harpist Lourdes de Leon Gregorio—will perform A. Vivaldi’s Concerto in C, First Movement. Other performers include Leo Angelo Lanuza, Stephanie Aguilar, Jade Riccio, Raymond Francis Muyot, Jilbert Chua, Glee Nette Gaddi, Abigail Garza and Jasmin Salva. Also performing are the Coro Tomasino, Liturgikon Vocal Ensemble, and Hail Mary the Queen Children’s Choir under conductor Maria Theresa Roldan. 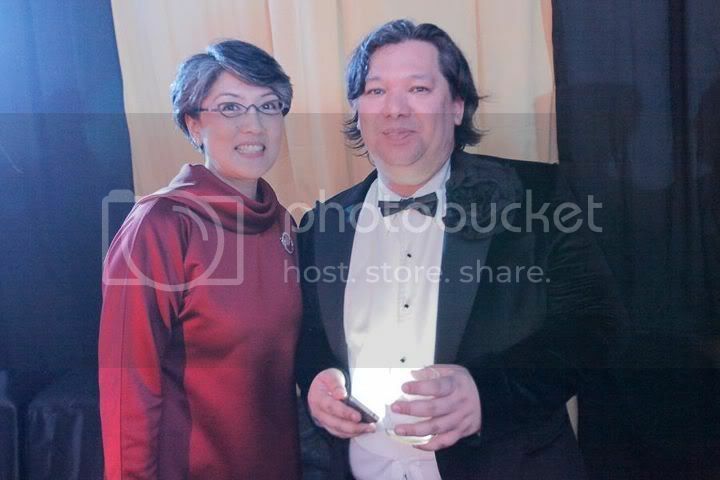 The 2013 Christmas concert gala is chaired by Abaño and art patroness Ma. Cristina Zobel. It is presented by Belo Medical Group and San Miguel Corporation. The Concert is open to the Thomasian community and the public for free on Dec. 4, 7 p.m. Call UST Public Affairs Office at 4061611 loc. 8315. For the first time, the annual Christmas gala concert of the University of Santo Tomas (UST) will be top-billed by multi-awarded singer and theater actress Dulce, along with the school’s resident performing groups, tomorrow, 7:30 p.m., at the UST Santissimo Rosario Church. Most importantly, palangga, proceeds of the Yuletide gala show, now on its 11th year, will go to survivors of Supertyphoon “Yolanda” in eastern Visayas. Previous beneficiaries have been the scholarship program of the UST Conservatory of Music and the heritage conservation program of the UST Museum of Arts and Sciences. Also performing are the world-renowned UST Singers, the UST Symphony Orchestra, UST Conservatory of Music faculty members, Coro Tomasino, Liturgikon Vocal Ensemble, Hail Mary the Queen Children’s Choir, among others. UST Rector Magnificus Fr. Herminio Dagohoy, OP, is counting on the hardworking gala committee—led by art patroness Maricris Zobel and Fr. Isidro Abaño, OP, along with architect-interior designer Jonathan Matti and Beacon Holding Inc. managing director Andrew J. Gan—to ensure the success of the event. The Belo Medical Group and San Miguel Corp. are the show’s presenters. Fifi L’Amour Bubbly is major sponsor, while Dedes Zobel is a sponsor. Hola Philippines, the Philippine Daily Inquirer, Town and Country, and Metro Society are the media partners. Following tradition, the gala performance will be preceded by the lighting of the UST Christmas tree at 7 p.m.
It’s a must-go concert, dahlings, especially since it ushers in the Christmas season of giving—an act more meaningful as the money to be raised will go to the thousands of families affected by Yolanda’s wrath. And so, I ask you, palangga, be there to do your share. Give and donate! A table has been set up at the venue entrance to accept your kind donations; credit cards are accepted, dahlings. UST PERFORMERS lead the audience for a community singing of Christmas carols. 21 December 2013, 4:08 p.m. - THE SUDDEN downpour did not dampen the enthusiasm of the crowd in this year's Paskuhan, which was celebrated for a cause Friday evening. According to the UST Security Office, an estimated 60,000 Thomasians and outsiders gathered at the UST Grandstand and Open Field for the annual festivities. The celebration started with the traditional “Panunuluyan,” a re-enactment of the Virgin Mary and St. Joseph's search for a place for the Blessed Mother to give birth to the Savior. It was followed by the Paskuhan Mass presided by Rector Fr. Herminio Dagohoy, O.P. In his homily, Dagohoy told Thomasians to keep in mind the victims of Super Typhoon "Yolanda" in the Visayas. 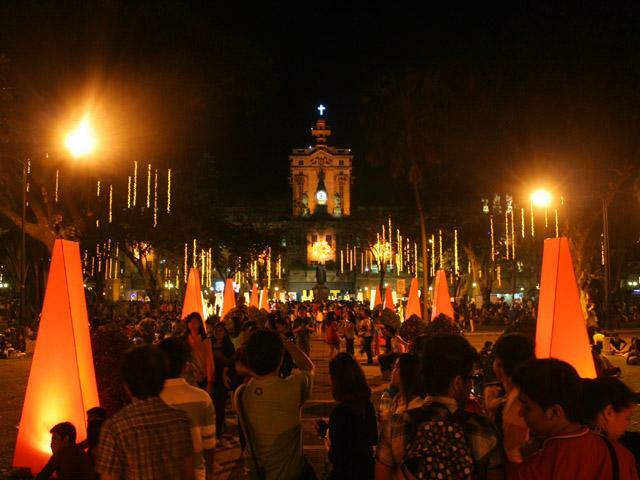 Paskuhan is a reminder of how God visited mankind by becoming man himself, he said. "Ang Paskuhan na ito ay iniiaalay natin sa mga nasalanta ng bagyo... Ang Paskuhan natin sa araw na ito ay magiging kakaiba," Dagohoy said. Mass offerings were donated to "Yolanda" victims, as part of the ceremonial send-off of donations to the affected areas. The annual agape was held beside the Main Building, where Thomasians were treated to popcorn, barbecue, puto bumbong and bibingka. The Panunuluyan, the Mass and the agape were held on the same day this year, unlike previous Paskuhan celebrations wherein the festivities were held on separate days. There was no fireworks display this year. Contrary to previous reports of University-based bands headlining the concert, famous bands and music personalities such as Parokya ni Edgar, Rico Blanco, Joyce Pring, Paraluman, Mayonnaise, and Never the Strangers performed for the crowd. Old-timers like Paraluman said they still found themselves nervous as they faced the welcoming Thomasian crowd. “Sobra naming pinaghahandaan kapag Paskuhan. Hanggang ngayon, sobrang mainit pa rin ang pag-welcome sa amin kahit na taun-taon nandito kami,” said Madz Ramboyong, Paraluman vocalist and College of Fine Arts and Design alumna. The Security Office again implemented the “buddy system,” wherein an outsider must be accompanied by a Thomasian. UST CHRISTMAS CONCERT. The UST Christmas Concert Gala 2013 will be aired on IBC 13 on December 24, 2013 at 7:00pm-8:00pm, and PTV 4 on December 25, 2013 at 7:00pm-8:30pm.